Way back when, a fellow by the name of David Letterman kicked off a late night talk show. One of his gimmicks in the early days was something called “Brush with Greatness” where Dave would speak with audience members who described their encounters with celebrities. Had I been in attendance it would have went a little something like this. 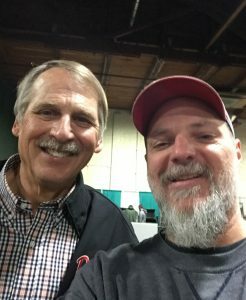 One day shy of a year ago today, I had the good fortune of meeting bass fishing legend, Hank Parker, at the QCCA Outdoor Show. I enjoyed his bass fishing seminar and then hung around long enough to have a conversation. Part of our chat revolved around his runner-up finish at the 1994 Bassmasters Superstars Tournament staged on the Illinois River out of Peoria, Illinois. My brother, Brent, and I were in the crowd for that final weigh-in and were really pulling for Hank to win it and he sure looked like he had it in the bag with one angler left to hit the scales. That fellow, O.T. Fears III, nabbed a four-pound kicker fish late in the final day and wound up knocking Hank Parker out of the top spot. Brent and I were pretty bummed that Hank got edged out of the title. Fast forward almost 25 years and I got to hear all about it first hand from the angler himself. A very gracious man who gave credit to the winner and who could still grin as he related the close call. Of course, Hank Parker is pretty much smiling all the time and is as entertaining in person during a candid conversation as he is in front of the camera. It was quite a treat to spend a few minutes talking fishing and I even went as far as asking if I could take a picture with him. Maybe a little weird for a 50-year old guy to make such a request but you’ve got to realize that the man is a flat out hero to this guy. After all, once upon a time I used to be a teenage kid watching him do his thing on a Saturday morning fishing show. Kind of fun to feel like that kid again over thirty years later.